9th July 2015, a Saudi led coalition airstrike hit a school sheltering the displaced in Tahrur village in the Lahj governate north of Aden, Yemen, killing a family of 10 including 4 children and 5 women. 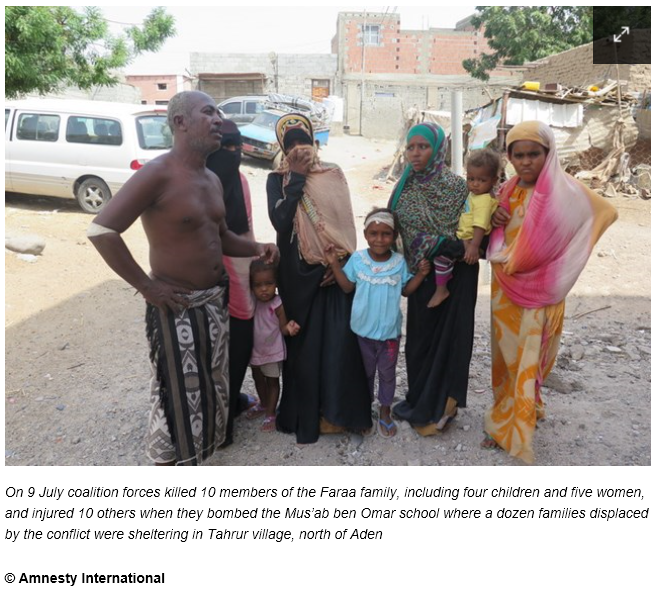 On 9 July coalition forces killed 10 members of the Faraa family, including four children and five women, and injured 10 others when they bombed the Mus’ab ben Omar school where a dozen families displaced by the conflict were sheltering in Tahrur village, north of Aden in Lahj governorate on 9 July at about 1pm. The displaced people who were sheltering in the school are members of the “muhammashin” (marginalised) community – Yemeni citizens of African origins, one of the country’s poorest and most vulnerable communities in the country. “We came here to escape the war in Huta (a 1km west of Tahrur). We had nowhere else to go. We have nothing. How could I imagine that we were going to be killed here? My girls were killed and I wish I had died with them. I have nothing else in life”. Neighbours told Amnesty International that the last time they saw any Huthis was four days before the strike, when two Huthis passed by the school but did not stop. They said that before the airstrike Huthis used to stay in a school and nearby building in another part of the village, less than a kilometre away. However, that location was never targeted by coalition forces and neighbours said that Huthi/Saleh loyalists armed groups stopped gathering there after the strike on the Mus’ab Ben Omar school, which killed members of the Faraa family. Amnesty International found no evidence indicating that the Mus’ab Ben Omar school was being used for military purposes. All that was visible in the ruins of the school were remains of the meagre possessions of the displaced families who had been sheltering there – blankets, cooking pots, children’s clothes - as well as a fin of a bomb from the Mark 80 series US-designed general purpose bombs, similar to those found at many other locations of coalition strikes.